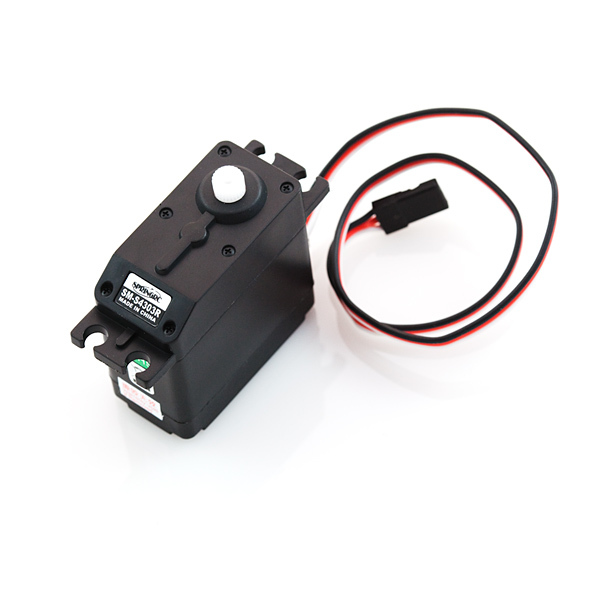 Here, for all your mechatronic needs, is a simple, high quality continuous rotation servo motor. 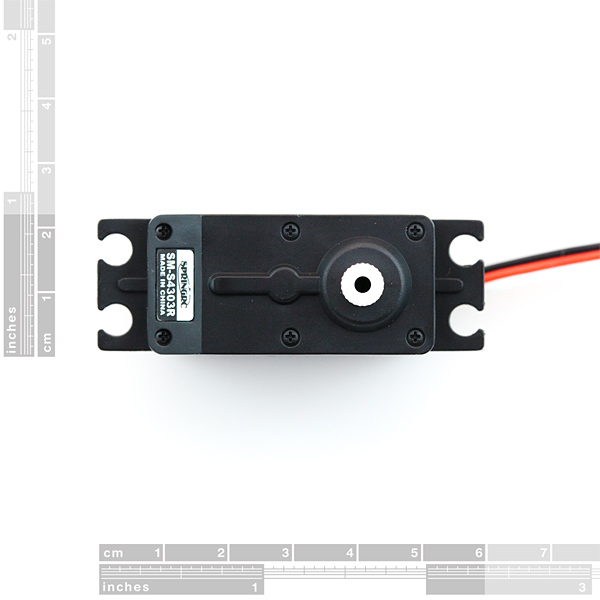 This servo is able to take in 6 volts and deliver 66.7 oz-in. of maximum torque at 70 r/min. Make sure that you use a separate power supply that is sufficient enough to power the Generic High Torque Continuous Rotation Servo. 5V from a computer's USB port and Arduino microcontroller will not be sufficient enough to power the system. The servo can pull enough power to brown out your Arduino or not move the servo. Is there any coupler for this servo to attach 1/4" shaft? Does anybody know? Servos are (usually) DC motors that allow you to control the angle of the axle. The way they do this is by packaging a motor, potentiometer, gears, and a small circuit board in a plastic case. The pot and motor are attached together by gears and the electronics attempt to use feedback from the pot to maintain a position with the motor. Pulse width: .9-1ms = all the way one direction, 1.5ms = center range, 2-2.1ms = all the way the other direction. Normal Servo (ROB-09065 and ROB-09064) usually have a movement range of 90 degrees. You can get ones that do 180/360+ degrees. Continuous Servos (ROB-09347) don't allow angle control. They simply spin in both directions and instead of angle control you get speed/direction control. The same PWM settings are used but in this case .9-1ms pulses = fast one direction, 1.5ms = stopped (sort of), 2-2.1ms = fast the other direction. Note that, while this does have a 24-tooth spline, it's not compatible with the C1-spline accessories sold by ServoCity (or at least the sprocket I got). Yes, I have the same experience. This definitely does not fit the ServoCity/Actobotics (now sold by SF, as well) 'HiTec' compatible accessories. Neither do some Spektrum servos I have. This arbitrary lack of compatibility between seemingly interchangeable devices is frustrating to me as someone not otherwise in RC planes, etc. I have a pair of these fellas on an educational robot platform (diy). They work great. I'm sending 'microsecond' commands from an Arduino - rather than angular commands - as it offers higher resolution. ...anything in between gives a proportional speed. Very handy. 120 mA at 5V for full speed unloaded. If you load it up, I got it up to about 250 mA before I decided not to break the thing. Hi Beardy - thanks for this comment! I was having problems getting this servo to actually stop. Worked great for me. Thanks again for pointing me in the right direction! Would it be possible to have 2 of these servos controlled by different light sensors in a Arduino board? So that sensor A triggers servo A and sensor B triggers servo B.
isn't it a must to use delay() to control the rotating time? So I guess they might not be able to operate at the same time. For say, when sensor B is triggered during the delay of servo A, it might not work? You should be able to use the millis() function to approximate a delay without fully blocking execution. Just set up different timers/intervals for each of your motors and check the current time at each loop. Oh, yeah, that gets a bit tricky. you can track time elapsed doing a while loop. but yeah, you're right, it does get a bit more complicated. Does anyone know what weight this will support? Also, any ideas on where to get wireless servos? 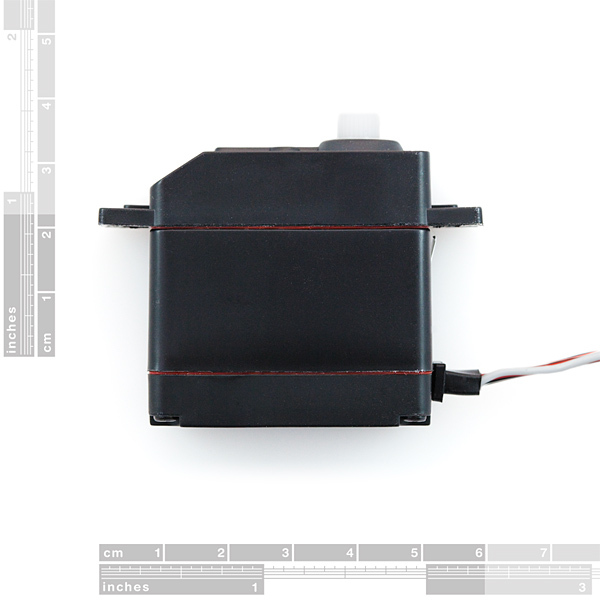 Be aware that although the flange is the same, the body on this SpringRC SM-S4303R servo is larger than the Standard Parallax/Futuba/HItec servos are. In my case the 0.1" added depth mattered. Check your design to be sure. what would be the code for the IDE to make this motor go fully back and forward? I need 60+ motors that spin continuously at exactly 1rpm for a project I am working on. Continuous rotation servos seem to be the cheapest option, but it's unclear whether I can get such a specific rpm. I am also wary about having to adjust the rest point all the time. Could this motor work for my application or is there another option? Or a bunch of really small stepper motors. You could daisy chain their control together and command them all at exactly 1rpm. Without some sort of speed feedback on each servo, it may be hard to get exactly 1RPM out of them. Can you use cheap battery-powered clock movements with second hands? They've been used for very lightweight (and slow) robotics before. Could someone explain what the "Rest point adjustment" does. Thank you. I have no idea what I'm doing wrong, but my servo won't move with less than 12V at 300mA from a wall wart. I've tried all sorts of sketches, including this one, but no changes to the variables make the servo stop or slow down. What's going on??? I have the power connected to the power rail of my breadboard, ground from arduino to the ground on the power rail, and the servo connected to the power rail with the white pin in arduino pin 9. I hope you've found your answers before this, but if not: The servo PWM pulse is expected to be between 1000 and 2000 microseconds (average). Some servos will try to achieve positions between 500 and 2500 microseconds (positional servos may try even if they are physically incapable, so be careful!). Sending a pulse of 4500 or 7000 will just get ignored, as they are out of range. So basically you told the servo to stop (1500 = "center" for positional servos or "stop" for continuous rotation), then you sent pulses out of range that got ignored. One final note is that most hobby servos expect a 6000 to 9000 microsecond space between command pulses, and may not respond to changes from pulses sent before 6000 microseconds have passed. I just bought two of these. I'm a beginner with this stuff, so I have a couple of questions. 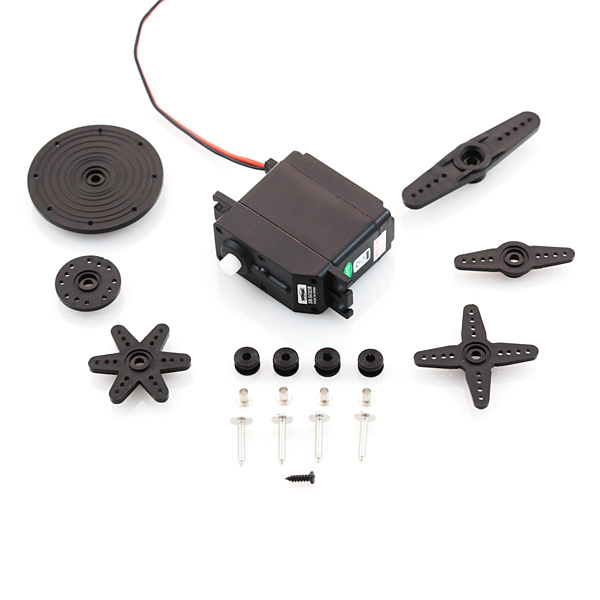 First I want to know if I can get feedback from this type of servo. I want to know the position (in degrees) of the servo. Second is there any way I can changes this servo so that I can control its range? Same case here, I need position feedback for implementing odometry dead-reckoning on an Autonomous Mobile Robot. Have you figure out something already? You think we can explore the interior of the servo and take advantage of any circuit in there? how precise are these? can i rotate a degree at a time? This is a continuous rotation servo; it only changes speed and direction, you can't set angle. nice information how to servo motor works. How many milliamp's per hour does this draw? I need to know what battery to get. @SparkFun: Torque is measured in forcedistance ie kgcm, not kg/cm. This is also what the datasheet states. So, is kg/cm = kg*cm? I mean, how does this unit even make sense? The / is equivalent to per, so kg/cm is equal to kg per cm. Both conventions are used. I brought this exact point up as well, but since both are used commonly, both remain on our site. Does this use a standard Hitec or Futaba spline? You've probably already found the answer to your question, but for other customers: this uses a standard Futaba spline (24 teeth). Sorry about the technical language... If I'm not mistaken, a glossary of terms used here can be found on Wikipedia. They are called servo horns or servo arms, and unfortunately we do not sell them separately. This is a standard-sized servo, though, so your local hobby shop can definitely help you out if you need some without buying a servo. any idea when the next batch will come back in stock? SparkFun How many milliamp's per hour does this draw? Is the torque confirmed on this? If not, what is the source of this info? The torque information is from the datasheet. Do you have any wheels that we can mount on this continuous rotation servo? I didn't see any in your "Wheels" section. That would be quite handy. I don't think that we sell any wheels that connect to this servo direct, sorry. I ordered these when they were on sale, and tried them out as soon as I got them. They worked fine with the arduino sweep example, and I haven't touched them since I got them. Today, I got them out again to build a robot, and for some reason, neither of them work with the sweep example. One of them just buzzes without moving at all, and the other just continuously spins in one direction forever. Anyone know what happened? While the servo is running/buzzing, use a small screw driver to adjust the 'rest point adjustment'. The motor should start running again. I figured it out after I opened the servo, which wasn't needed. I successfully plugged in 4 at once to my Duemilanove on 4 different pins and ramped all of them up and down, backwards and forwards with the sample code at the url. No other driver/shield/h-bridge needed. Grab some when they go on sale again! Can you control the speed of these motors? My thought was (if it's possible) pulse widths further from the 0 position would result in a somewhat faster speed. Figured it out after receiving one in the mail. Can this be modified to work as a normal position-control servo? I would think it would be extremely hard to re-modify it back to a normal rotation servo. and i don't think it can be used like a normal servo because the position control hardware was taken out. If I want to operate this with an arduino (using the 9v 650mA wall-wart power) and I want the most possible torque, would it be safe to run it through the v in pin (voltage in, 9v 650mA) or am I restricted to the 5v pin? I just received this servo, I am using i with my Arduino. Connected it via the Servo class, every time I set the servo to angle 0 using myServo. (write); Zero becomes a spot on the servo. What am I missing? OK...so I understand that the servo cant be set by angle, which isn't too important for what I need. How do I change the direction the motor is going? And the speed? 0 is full speed reverse 90 is stationary and 180 is full speed ahead. So 45 is half speed reverse. How many mA's does this draw? can I run it right off an arduino pin (max 40mA)? I think I answered my own question--the signal and power wires are separate. (new to servo land, sorry). Mechanical drawing? Data sheet? Particularly, the nature of the output shaft? I would like to source gears to fit. Ultimately to operate lens controls (focus, zoom, iris, etc.). Maybe all servos have standardized shafts? But a mystery to those of us without R/C experience. this looks like a pretty standard servo, but a non standard supplier...i dunno what to else to tell ya. Is this a continuous servo, a regular servo with an extra-wide-range, or something else? That might be kinda handy to know...it is continuous. Does what it's supposed to do. Easy to connect, easy to use. Goes well with Arduino-based projects as well as other applications. Works great as part of a home made useless machine project. We bought multiple units for our elementary robotics club, two of them are working great, one is not. They were all doing the same task on the robots but one of them the gear stripped out in no time. The other two held up under a day long Robotic Expo and were easy to use. Don't know if I just got a dud with the other one. Over all they were dependable and easy to mount. All of the students want to use it! Students found that this versatile servo really fit the needs and functions of their projects. We bought 10 of these servos to use as "drive motors" motors for student design and built mini robotics platforms to be RC and/or Arduino controlled. Worked out perfectly. plenty of power for our application.